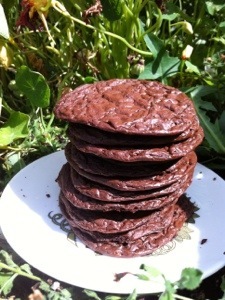 I promised everyone a recipe taken from this Flourless chocolate fudge cookie recipe that did not use confectioners sugar. They are also super simple to make! So basically I just substituted the confectioners sugar for coconut sugar and 3 tbsp of arrowroot. One batch I use xanthan gum but I really don’t think it is necessary. It was easy to play with, adding mint or dried cherries, cranberries. Maybe you will play with the recipe too and let me know? Drop onto greased parchment paper (never wax!). These cookies REALLY spread out. So I tried to do 1 inch across blobs with lots of space in between. -what can you think of? Chaz and Emmett and Brother-Love.